10. They are "worthy to gather up the crumbs under thy table." 9. The question "Who let the dogs out?" would become a theological conundrum. 8. Panting the Eucharistic Prayer is a far cry from chanting it. 7. Dog spelled backwards is God. Pastor spelled backwards is Rotsap. 6. Lifting a leg is not considered a "manual act." 5. They're much too dogmatic. 4. 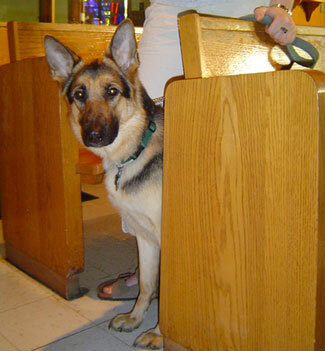 Jesus didn't say "I am the German Shepherd." 3. Christus Rex doesn't refer to one of your litter mates. 2. The priest's host is not a frisbee. 1. There's a fine line between a cassock and a doggie sweater. However, all dogs go to Heaven. Very funny! Just wondering how did you find my blog? Thanks, Joygal! I don't know -- just googled the list (can't remember where I saw it initially) and your blog came up. I liked the format, thus the link. Keep up the good work. Thanks Father Tim! YOu are really helping my traffic. I can't wait till I have more time to look at your other writings!